Terrific hand-held documentary following Bob Dylan on tour round the England of 1965. 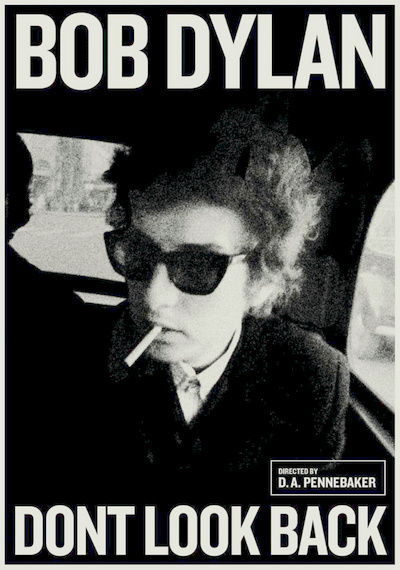 Audiences don’t need to have any kind of liking for, or knowledge of, Dylan’s music at all: Pennebaker is more interested in the phenomenon of Dylan, who in the context of mid-sixties Britain seems like some weird, cool alien visiting from the future. From the airport, we see Dylan and his entourage making their way through a series of grim hotels and gig venues, the accents of his (very young) fans letting us know when we’re in Newcastle, Liverpool, Leeds, London, etc. The countless highlights include hilarious appearances from a drunken, laddishly sycophantic Alan Price (from The Animals), a nervy Donovan, Dylan’s no-nonsense manager Albert Grossmith (Don’t Look Back‘s producer) and a comparatively beatific Joan Baez. Working in rough-and-ready black-and-white, Pennebaker achieves an immediacy and intimacy worthy of the finest nouvelle vague and dogme fiction features – there’s barely a dull moment over the whole 96 minutes, even if the last half-hour does become a little too ‘Dylan in Concert at the Albert Hall’ for non-Dylanites’ comfort.